Wine & Spirit Education Trust, Court of Master Sommeliers and Society of Wine Educators and Wine Scholar Guild…what’s what? If you are looking for wine education or to establish your credibility in the wine industry with a wine certification program, there are several well-established and recognized routes from which to choose. 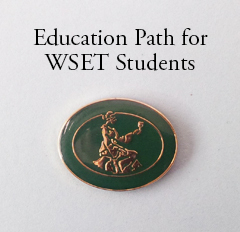 Three of the most well-known and respected organizations offering general wine education programs are the Court of Master Sommeliers (CMS), the Wine and Spirit Education Trust (WSET), and the Society of Wine Educators (SWE). We are often asked how the Wine Scholar Guild and its programs compare to these other wine certification organizations and their programs. Here’s our guide to help you understand the differences and make informed choices about your wine study path. Study programs of CMS, WSET and SWE are broad-based courses and cover all the major wine producing countries of the world giving the wine student a well-rounded, global perspective. Furthermore, each tend to lead toward a different end goal and carrier path as students climb up their different levels of instruction. Wine Scholar Guild offers programs allowing students to specialize (in a specific country and/or region(s)). Our Wine Scholar™ education programs focus on a single country – France, Italy or Spain – and dive deep, allowing students to focus their learning on the wines of a specific country. Our Master-Level programs go a step further and focus on a single wine region, giving advanced students the opportunity to develop an area of specialization and expertise. France, Italy and Spain are the top three wine producing countries in the world. Having an in-depth understanding of these wine producing countries is critical to all wine students. 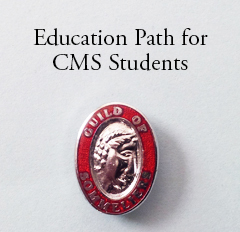 In this regard, Wine Scholar Guild wine certification programs supplement and complement the study programs offered by CMS, WSET and SWE; they do not replace them. Our wine study manuals are current, succinct and objective - without being encyclopedic. We have a wealth of online resources that include downloadable documents, wine education videos, wine e-learning modules, online wine quizzes and discussion forums. All of these learning tools can be applied to other curriculums, particularly those that place a greater emphasis on self-directed, independent study. New students of wine - gain an understanding of the fundamentals of viticulture, winemaking, grape varieties, wine tasting, wine service and more. Intermediate to advanced students of wine will benefit from exploring key wine regions and wine appellations, advanced wine service, regional wines and food pairings, and the trends and evolutions within key wine regions like Bordeaux, Burgundy and Champagne. 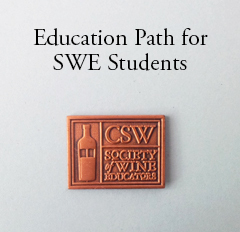 WSG membership is a must-have for all committed students of wine! Our country-specific Wine Scholar programs can help intermediate to advanced wine students to gain understanding of the key regions of France, Italy and soon Spain. A foundation unit puts the country’s history, wine laws, grape varieties, viticulture, and winemaking practices into perspective before diving into advanced wine study of each of the country’s wine regions. Topics covered include regional history, climate, topography, geology, soils, appellations and wine styles. Supplemental materials discuss regional foods such as breads, cheeses, local dishes and renowned agricultural products or foodstuffs. In-class wine tastings provide the opportunity to hone your wine tasting skills, network with peers and become well-versed in the wines of France, Italy and Spain. 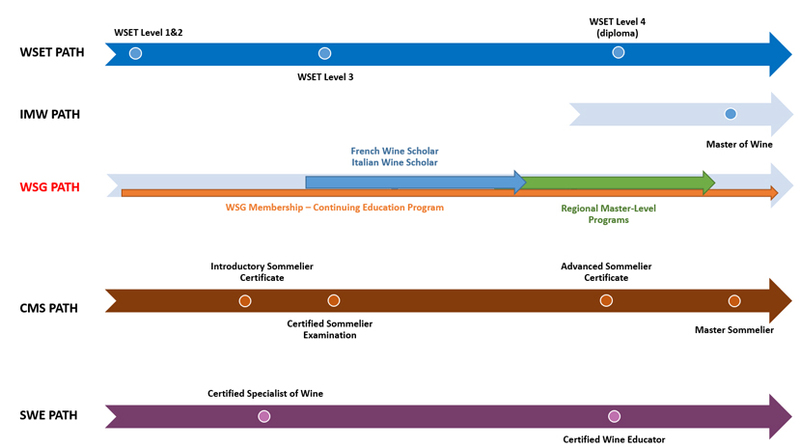 Our French Wine Scholar, Italian Wine Scholar and Spanish Wine Scholar programs can serve as a helpful complement to intermediate general wine study programs such as WSET level 3 and up, Court of Master Sommelier level 1 and up as well as the Society of Wine Educator (CWE) Certified Specialist of Wine (CSW). General wine study programs such as WSET level 3 and up, Court of Master Sommelier level 1 and up as well as the Society of Wine Educator (CWE) Certified Specialist of Wine (CSW) will give wine students a strong foundation to enter our Wine Scholar Programs and Master-Level programs from a position of strength. While not a pre-requisite, we encourage students to follow a program such a program before entering our Wine Scholar Programs and Master-Level programs. Focusing on a single wine region at the deepest level, our Master-Level programs provide wine education under the wings of true regional experts, allowing advanced wine students to master the complexities of the world’s benchmark wine regions. Master-Level programs can be coupled with our immersion study wine tours in France, Italy and Spain. Both Master-Level programs and wine study tours can serve as a helpful complement to advanced courses of study such as the WSET Diploma, the Master of Wine credential, CMS Level 3 and up or the Certified Wine Educator credential. NOTE: We have tried to describe general wine study programs to the best of our knowledge and to explain how our programs complement them. These statements represent our opinion and do not reflect the opinion or endorsement of the other wine certification bodies mentioned in this article.